A brownfield site is: real property for which the expansion, redevelopment, or reuse may be complicated by the presence or potential presence of hazardous substances, pollutants, contaminants, controlled substances, petroleum or petroleum products. From former power stations to vacant textile mills, many spaces in Lawrence were once in desperate need of redevelopment, but faced a large issue: contamination. Some contaminants found in Lawrence sites included arsenic, lead, petroleum, and asbestos. In 2002, these sites began getting the attention they deserved, and with support from the EPA and various other grant sources, contaminated sites throughout Lawrence slowly transformed from eyesores into beautiful greenspaces and businesses. Check out Manchester Street Park (the former Covanta site) to learn about one such successful renewal project. Groundwork Lawrence currently supports the City of Lawrence's Brownfields program. With the help of EPA Brownfield Assessment grants, sites are assessed, revisioned, and cleaned up. Groundwork, along with community partners, is working hard to renew abandoned and contaminated sites throughout the Lawrence area. 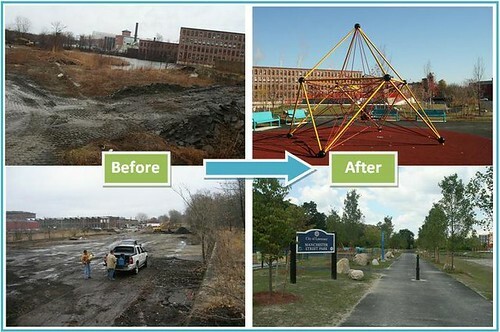 These efforts have been very successful, as marked by Manchester Street Park's reception of the Brownfield Renewal 2010 Social Impact Award and its label as a "a stellar example of equitable riverfront renewal and environmental justice". Groundwork's work was also just highlighted by the American Society of Landscape Architects--read about it here! To learn about successful Brownfield renewal projects in Lawrence, please visit our Success Stories Page! 1. Brownfield work begins with an Environmental Site Assessment, typically funded by an EPA assessment grants. Phase 1:The purpose of the Phase I Site Assessment is to calculate the likelihood that environmental contamination is present at the site, which is determined by a thorough site investigation. The site investigation includes a visual site assessment, an interview with past and present owners/occupants, a search for any environmental liens, a review of historical documents, and a search of databases regarding contamination at/near the site. Findings in the Phase I report determine whether or not further site investigation is warranted. Phase 2: Phase II Site Investigations include a more thorough review of site conditions, and typically include: performing soil borings and collecting soil samples; installing water monitoring wells and collecting groundwater samples from each well; and analyzing all samples for the presence of contaminants.This allows for a more comprehensive report of what contaminants are present on the property (as well as how much). Phase 3: Phase III Investigation and Remedial Action Plan is typically the final stage of a Brownfields Assessment Program. Phase III investigations may consist of additional collection of samples and continued investigation of any anomalies discovered during the Phase II investigation. A Remedial Action Plan is then determined. This plan consists of a Soils and Material Management Plan for off-site disposal or on-site reuse of impacted soil, suggestions for ongoing groundwater monitoring, a list of permit requirements needed to engage in remedial action, and suggestions for the use of institutional controls such as activity use restrictions. In this second step, the site is readied for redevelopment. This can include completing the necessary building demolition and waste removal, remediating the site, or implementing risk management strategies. Plans for new designs of the space are then completed, and after they are solidified, construction of the new site begins. The new site infrastructure is set up, and after completion, the new site is opened to the public.